Of all the sausages I've made, this is the recipe I have practiced the most. It's also my most popular sausage, within both my family and my friends. Last summer I was commissioned to make twelve pounds of it to serve at a wedding for one of Carla's colleagues, which was a big honor. It's a simple recipe, but the repetition of making it over and over has helped to refine the finished product. I first had this sausage at Pigstock, where it was made by Michael Clampffer from Mosefund Farm. I didn't get his recipe, but the flavors stuck with me. Plus, I had never seen anything like it: a sausage studded with 1/2" cubes of cheese that oozed out when you cut them. 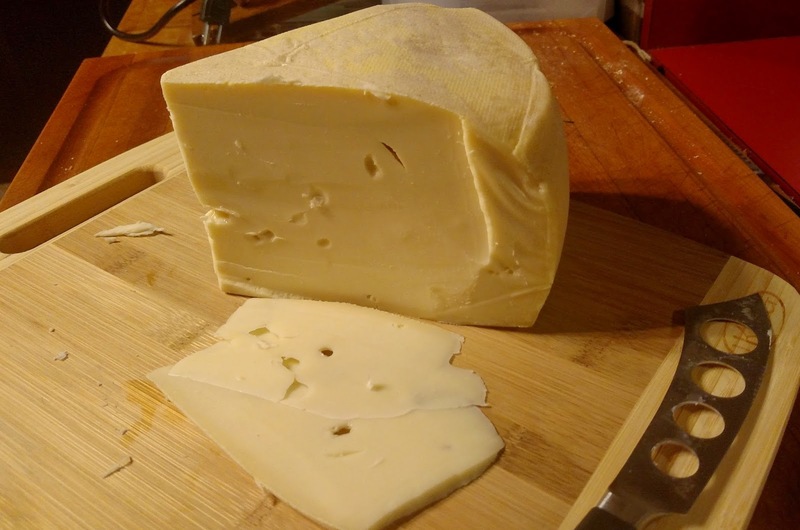 I've tried lots of different cheeses in this recipe over the years, from Gruyere (seemed to overpower the flavor of the meat) to domestic Munster (too bland) to blending a few cheeses together. Ultimately I find some type of Emmental-style cheese is best. It's durable enough to withstand the sausage press, but melts smoothly when the sausages are heated. Lastly, this type of cheese is full-flavored without dominating the taste of the pork. My current favorite is an Austrian cheese called Moosbacher. Made in the Emmental-style, Moosbacher is wrapped in a damp linen cloth during aging to help develop a slightly funky washed rind. Plus, it's more affordable than true Swiss Emmental. The sausage meat is finely ground pork shoulder. Usually 2-3 passes through the grinder should do it, which will give you a smooth, uniform forcemeat, like in a kielbasa. The seasoning is very simple: just salt, sodium nitrite, white pepper, and mustard powder. 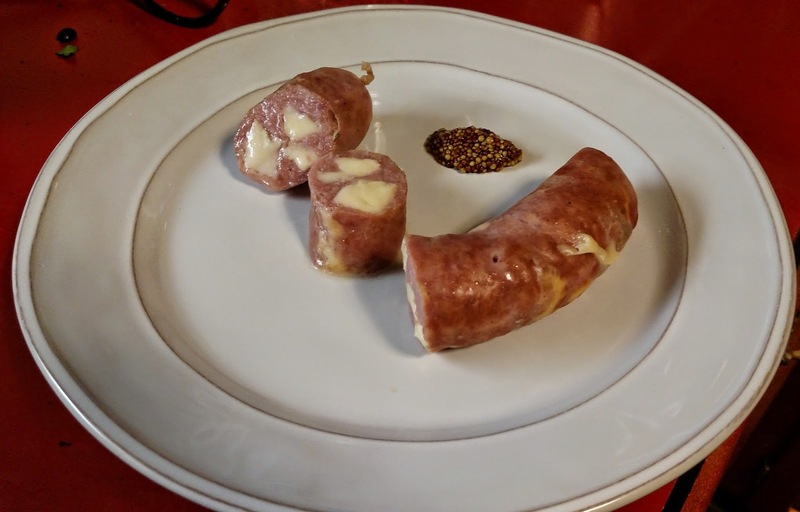 I think the white pepper and mustard powder gives the sausage a bit of bite to balance the richness of the cheese and pork. Then the cubes of cheese are mixed through the forcemeat and packed into casings. Next the sausages are cold smoked for a few hours to build in another level of flavor. I suppose you could skip the smoking process, but for me it really brings the sausages to another level. My dad describes the flavor of these sausages as "comfort food." And on a cold day nothing could beat the flavors of smoked pork and warm gooey cheese. 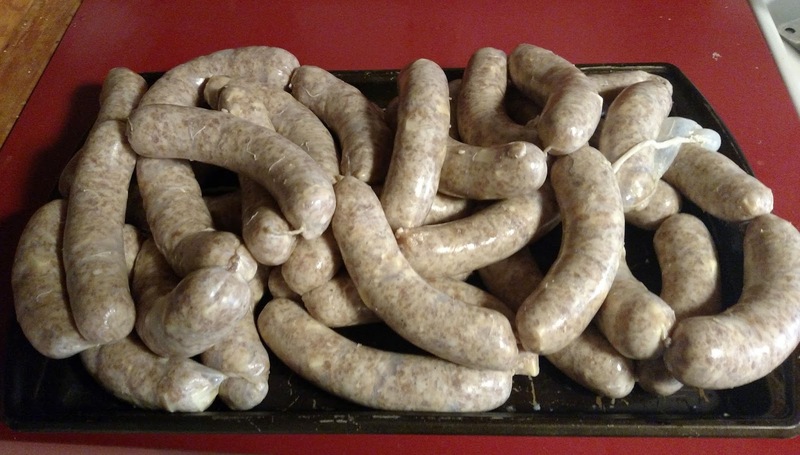 Along with making these sausages over and over, I've worked hard to find out the best way to cook them. 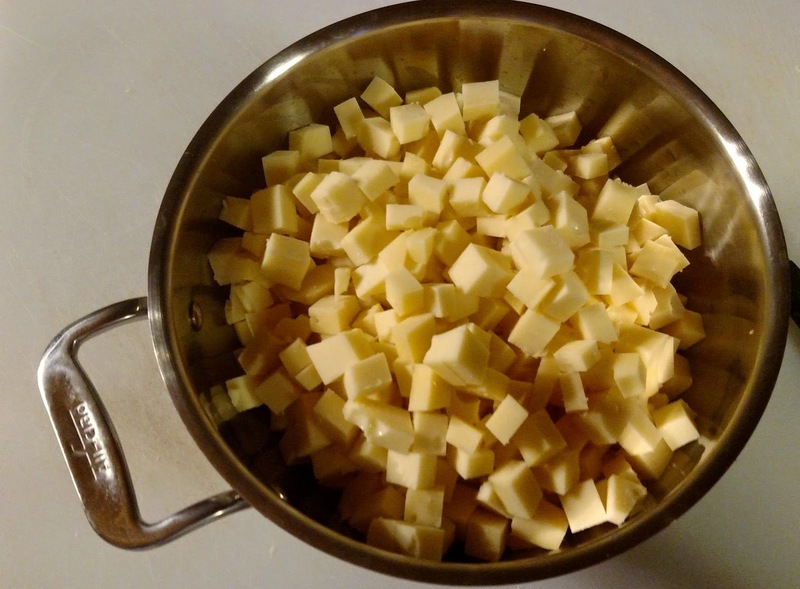 In a hot skillet the cheese will boil and burst out, ruining the effort of stuffing the cheese inside. For a while I would slowly bake them, allowing the meat to gently come up to temperature and sealing in more of the cheese. 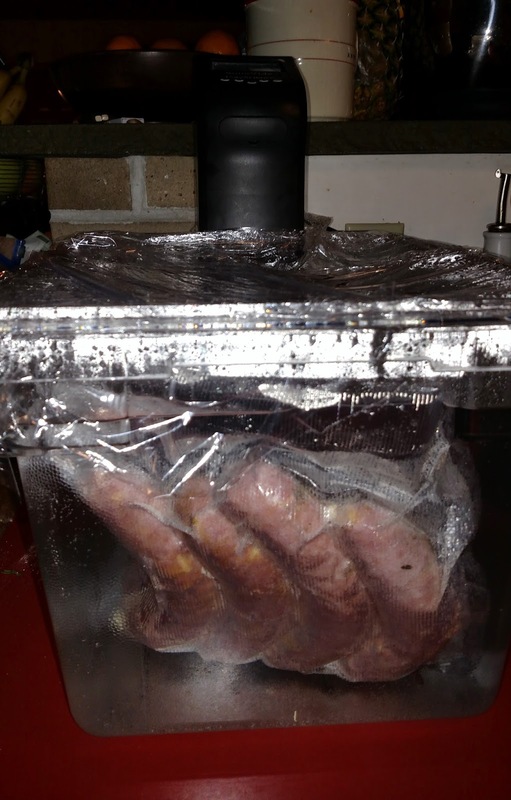 Lastly, I found that poaching the sausages was the best, as it contained all of the cheese still cooked the pork through. Now I use my immersion circulator to cook them, but previously I would use a large pot of below-simmering water to cook them. So while this isn't a very "fancy" recipe, I think people love it because the sausage is so inherently satisfying and savory. The recipe does have a lot of steps, but the finished product is a perfect mixture of textures, rich flavors, and a lingering smoky aroma.